Rummy is one of the many classic games for Canada and other countries. The main objective of the game is for players to be first in getting rid of their cards on hand. They can discard cards by creating melds of "runs" which are composed of three or more cards with the same playing suit, or "sets" which are made of three to four cards with the same value or rank. It may seem to have an easy gameplay, but rummy at no download online casinos is still challenging as it is usually played with 2 to 4 players around the table. They will randomly deal cards from a deck at play, and complete different melds to win the game. There are also different variants of this prominent card game available in the industry today. These include traditional rummy games, as well as innovative and online ones. Players can now play rummy free through several online platforms. Online rummy is considered legal by the Hon'ble Supreme Court of India in 2015 as it is considered as a game of skill rather than by chance. This classic card game starts with dealing cards to active table players. 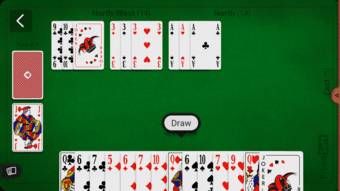 Ten cards are dealt with each player if there are only two participants; whereas seven cards are given if there three or four players. Once the cards are dealt, the remaining deck is then placed in the centre of the table face down. Only one card is randomly left faced up beside the deck as the discard pile. Players then start by drawing one card from either the discard pile or the deck. They may opt to start placing their melds on the table as soon as they complete one. They are allowed to place more than one meld during their turn. But some rummy variants only allows one meld to be played per round or turn. They can also lay off their cards into runs or sets present on the table. Players are allowed to lay off multiple cards as long as they haven't placed any meld on the table during their turn. Players should end their turn by discarding one of their cards on hand into the discard pile. They can't discard the card from the discard pile in the same round it is drawn. If players only have one card left to discard, they need to place it on the discard pile with face down and win the game. This step-by-step process continues until one player completely discarded all cards on hand and wins the round. If the deck is depleted before anyone wins, the discarded pile will then be shuffled and be used as the new deck. But if all cards are again consumed from the new deck, then the player's hand is considered as a stalemate and no one wins the round. These may seem to be easy-to-follow steps on how to play rummy cards, but as mentioned before, this card game still requires skills and talents from its players if they want to excel in every round. In conventional rummy games, winners per round take all points accumulated from their opponents' remaining cards on hand. Face cards or the Jack, Queen, and King reward 10 points each. Aces account them to 1 point, as the other cards are equivalent to their value or rank. Furthermore, they need to collect enough points to win the entire game. Games with only two players have a 100-point limit, for three players have up to 150 points, and for four players have as much as 200 points per round. A player wins the game once the maximum score is reached. With this pointing system, it is advisable for players to meld and lay off cards as early as possible to avoid hoarding too many cards on their hands. However, players who have not laid off or melded any of their playing cards during the round but are able to discard them in one turn are "Going Rummy." This earns them a rewarding bonus of doubling their total points for that round. This may be considered a risky strategy for this fast-paced game, but it can really reward big when successfully pulled off. Unlike online blackjack and other casino games, there are instances when no one earns any point at the end of the round. These are called Stalemates - which may be triggered by two certain cases. The first one was already mentioned before which involves the deck being depleted twice with no one winning the round. The other case involves the game detecting that no player will be able to win the game. This instance usually happens when all players only have one card left in their hands with no meld or lay off possibility left on the table. Once the game is declared a stalemate, all players get 0 points for that round which is also considered a loss in their gaming statistics. 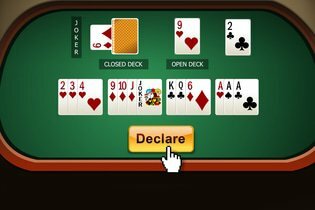 Players can now invite their friends and play rummy free in different online platforms and sites offering this exciting card game.